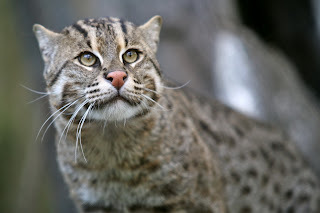 Animal Wildlife | Fishing Cat | The fishing cat is a medium-sized feline, natively found throughout the countries of south-east Asia, and is most closely related to the smaller leopard cat. The fishing cat is found inhabiting coastal wetlands, swamps and mangroves from eastern Pakistan right down to the Indonesian islands of Sumatra and Java. Fishing cats are also commonly found living close to lakes, rivers and streams. The fishing cat can grow to 80 cm in length with a 30 cm long tail on top of that. The fishing cat has dark mottled fur and is best known for the fact that it's paws are slightly webbed, which help the fishing cat when it is trying to negotiate slippery banks. As with many other feline species, the fishing cat is a fairly solitary animal and is also a nocturnal hunter meaning that the fishing cat primarily hunts under the cover of night. 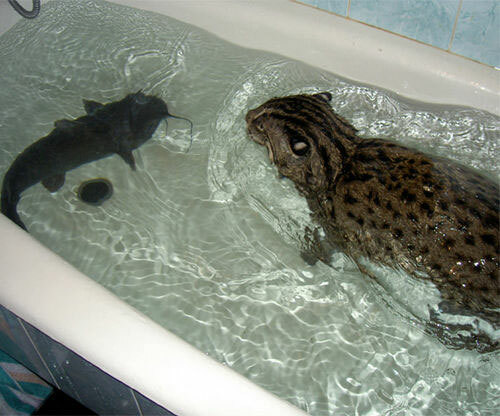 Due to their water-based lifestyle, fishing cats are also naturally very strong swimmers. 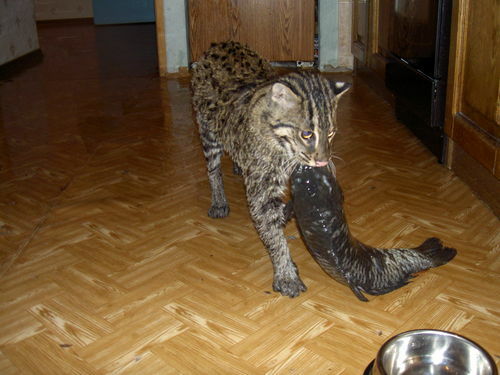 The fishing cat is a carnivorous mammal meaning that the fishing cat only eats other animals in order to gain the nutrients that it needs to survive. 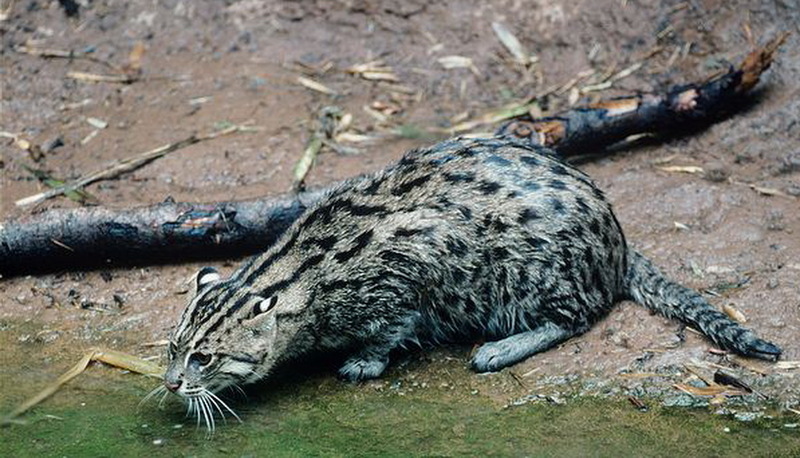 As it's name suggests, the fishing cat primarily eats fish and is known to hunt more than 10 different species of fish, along with other small animals such as frogs and rodents. Due to it's secretive and solitary nature, the fishing cat has few predators within it's natural environment, with large reptiles such as crocodiles and snakes being the main predators of the fishing cat. 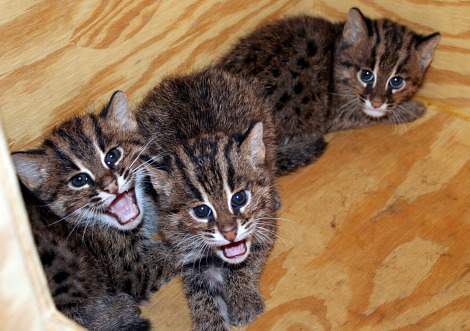 Once mated, female fishing cats give birth to between 1 and 4 fishing cat babies (known as kittens), after a gestation period that lasts for a couple of months. As with other feline kittens, fishing cat kittens are born blind and do not open their eyes until they are at least a couple of weeks old. Fishing cat kittens remain with their mother until they reach adult size and become independent at about 10 months old. 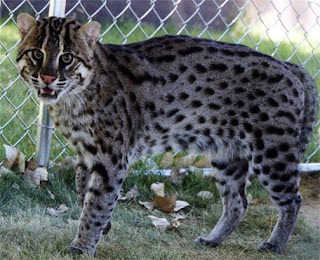 Sadly today, the fishing cat is considered to be an endangered species, which means that the fishing cat is at risk of becoming extinct in the wild. Deforestation and habitat loss caused by humans is the main reason as to why the wild fishing cat population is now so low. 0 Response to "Fishing Cat"